I remember my first triathlon and the anxiety I felt about swimming in the open water. It was not a pleasurable experience. However, over time and lots of practice the swim became one on of my stronger disciplines. 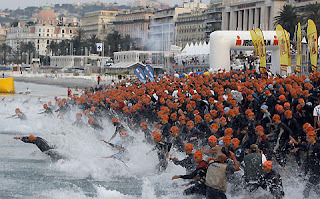 The swim portion of the triathlon can be a freighting experience for most. Below are some things that have helped me over the years become a stronger front of the pack swimmer. Test the waters- If possible get in the water all the time. The more you are in the open water the easier the swim portion of the race becomes. Try to expose yourself to the ocean, lake, and bay or in some cases a river at least once a week during your training sessions. Get comfortable swimming in a wetsuit, goggles and cap. It also helps to swim with a buddy so you feel safe. When swimming with a training partner have them on occasion bump into you or grab your legs to simulate the sensation of being crowded during the swim. When training in the pool practice “bobbing” in the water to simulate the two minutes you wait in the water for the starting gun to go off. Sighting and using your eyes- Sighting is by far is the most important skill any triathlete should learn. After all your body will follow where your eyes take you. On occasion you will need to lift your head above the water mid stroke to see if you are on course. Many times I have not sighted well and veered off course. This mistake takes time and energy to return to the pack. On occasion about every 10 strokes I lift my head above water for a brief second and focus on a land mark that I picked out before the swim begins. 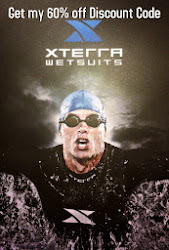 During your swim training included at least 50-100 yards of sighting drills. Stay in the back- If you are not a strong swimmer get away from the front of the back as soon as possible. This means that as you are waiting for the gun to go off stay in the back. The front is reserved for stronger and faster swimmers. The swimmers up front tend to be more aggressive and start fast to get a lead on the pack. The last thing you want is to be pummeled or pushed under. Starting in the back of the pack allows you to set your own pace and rhythm. So there you go. These few things have made me more relaxed and a successful front of the pack swimmer. With plenty of practice, relaxing, sighting and exposure you will have more confidence in your ability to finish your swim stronger than ever!